Objective: A major challenge in targeting orally administered drugs to colon is their passage through the long gastrointestinal path comprising highly variant conditions in terms of pH, viscosity, gut motility and microbial flora. Approaches to pH controlled release and microbially triggered release have proved to be successful in achieving colon targeting only to a partial extent. Methods: In an attempt to improve targeting, both these approaches have been combined together with the approach of liquisolid technology which, hitherto, remains unexplored for colon targeting. The combination of these three approaches is being reported for the first time to achieve colon targeting along with a burst release of a Biopharmaceutical Classification System (BCS) Class IV drug at the target site. pH controlled polymer, Eudragit® S-100 was used to prevent the release of sulfasalazine in the gastric region while microbially triggered polymers, pectin and guar gum were used to ferry the system through the intestinal region. Results: Liquisolid formulation was designed to provide a burst release of sulfasalazine in colon on the digestion of polysaccharide coating. 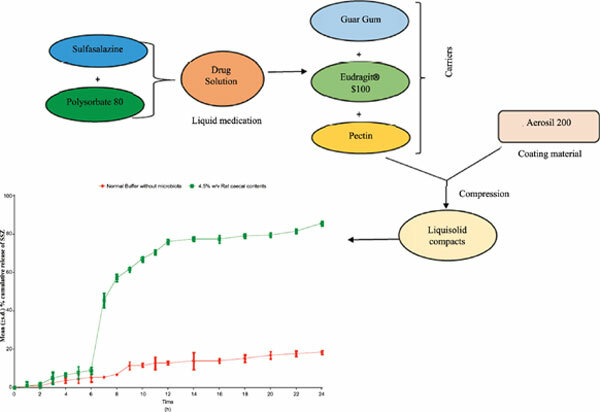 Conclusion: The results support the premise that the combination of pH sensitive, microbially triggered polymers and liquisolid formulation technique appears to be a pragmatic approach for colonic delivery of orally administered drugs. Eudragit® S-100, pectin, guar gum, liquisolid technique, colon targeted delivery.